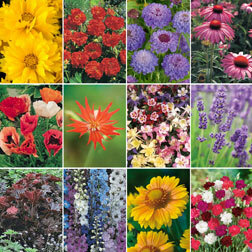 Fill your beds and borders with this bargain perennial bumper collection. Perennial plants will bloom year after year and they can also be cut for beautiful flower arrangements. from seed, plug plants or large plants. 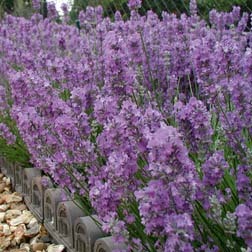 Add fragrance and beauty to your garden with this fabulous collection of English Lavenders. The fragrant flowers are highly attractive to bees, and excellent for cutting and drying. Perfect for fragrant patio containers or try growing Lavender as a low hedge or path edging where the perfume can be appreciated as you brush past the aromatic evergreen foliage. 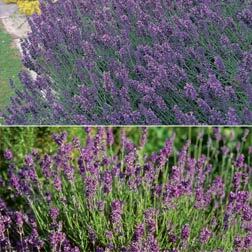 Collection comprises: Lavender angustifolia ‘Hidcote’ (12 plugs) – With its compact habit and dark purple flower spikes, this is one of the nation’s best known varieties. 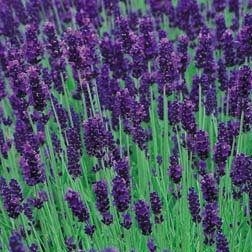 Lavender ‘Munstead’ (6 plugs) – This neat, compact variety of English lavender bears masses of dark purple-blue flower spikes. This neat, compact variety of English lavender bears masses of dark purple-blue flower spikes. The fragrant stems of Lavender ‘Munstead’ are ideal for cutting or drying, and the nectar-rich flowers are particularly attractive to bees. Lavender makes an excellent low hedge or path edging where the perfume can be appreciated as you brush past the aromatic evergreen foliage. Height: 45cm (18”). Spread: 60cm (24”). This neat, compact variety of English lavender bears masses of dark purple-blue flower spikes. The fragrant stems of Lavender ‘Munstead’ are ideal for cutting or drying, and the nectar-rich flowers are particularly attractive to bees. Lavender makes an excellent low hedge or path edging where the perfume can be appreciated as you brush past the aromatic evergreen foliage. Height: 45cm (18”). Spread: 60cm (24”). Culinary note: Lavender flowers are edible. 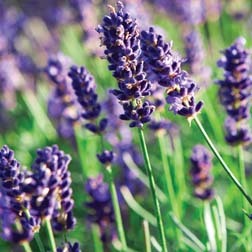 Create a tapestry of colour and fragrance with this variety of lavender. Plant alongside varieties ‘Hidcote’ and ‘Little Lady’ for a beautiful mixed hedge. The Crème de la Crème in the Lavender world, these plants are grown by cuttings from true ‘Hidcote’ stocks. Introduced in 1950 after being cultivated at Hidcote Manor, Gloucestershire, this is one of the best-known lavenders for the garden today. It holds an RHS Award of Garden Merit, meaning it comes highly recommend by a panel of experts for garden use. Height and spread: 60cm (24”). Create a tapestry of colour and fragrance with our exclusive Lavender Collection. Harmonious in colour and form, these three varieties can be planted singly or together, which make a great mixed hedge. Collection includes the varieties ‘Hidcote’, ‘Rosea’ and ‘Little Lady’. Plant sale up to 60% off – over 20 varieties to pick from. 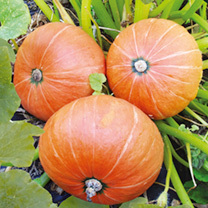 Pumpkin ‘Summer Ball’ is ideal if you can’t decide whether you want to eat them or look at them! 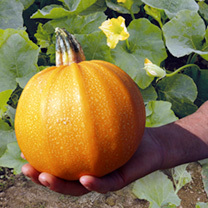 Can be grown as a courgette and picked or left to mature for large pumpkins! Sounds like the perfect pumpkin! Eat them until you’re sick of them (and the neighbours are sick of them) and then let them grow on! A first for British breeding! 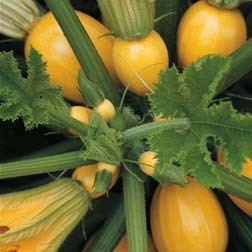 This unique ‘dual-purpose’ variety, Summer Ball can be grown as a courgette or as a pumpkin! 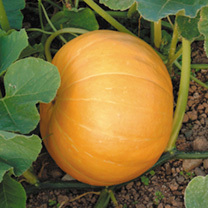 Compact, bushy plants produce bright-yellow, round fruits which can be cut early as courgettes or left to mature to larger 1kg (2lbs) summer pumpkins. 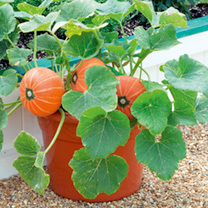 Pumpkin Summer Ball is ideal for growing in containers. Seeds are in the RHS Vegetable Collection. Beat the records! 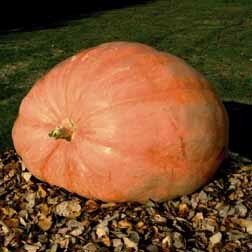 With seed taken from a record-breaking pumpkin weighing over 1200lb, you’ll be in with a chance. Ian Paton and his twin brother Stuart currently hold the record for the heaviest pumpkin grown in the UK with a fruit weighing in at an amazing 1,504lb. So why not try and grow a whopper with these special seeds? Maybe you’ll smash the British, European or even the World record! Trailing. Using Pumpkin Dill’s Atlantic Giant growers have produced monster pumpkins weighing over 600 lbs, and it holds the Canadian and American records for size and weight. Even if you don’t want to produce a ‘record breaker’, Pumpkin Dill’s Atlantic Giant is excellent for delicious long standing pumpkins for pies, carving Jack O’Lanterns, etc. Trailing. 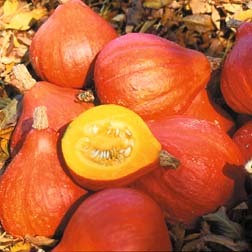 A famous French heirloom, the name of Squash Potimarron derives from potiron (pumpkin) and marron (chestnut). Squash Potimarron is one of the very best for baking and roasting, fruits reach 1.25-1.75 kilos (3-4lbs) in weight with an aromatic chestnut like taste. Good for storage. 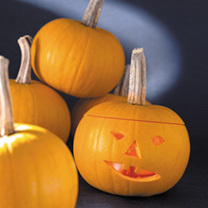 Perfect for Halloween carving, as each fruit of Pumpkin Jack of All Trades weighs approximately 4kgs (9lbs). 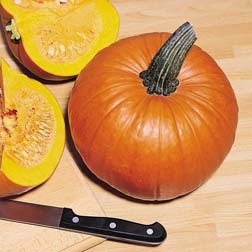 Pumpkin Jack of All Trades produces fruits which have a flat base but rounded shape, with a rich orange skin and flesh, making superb pumpkin pie and a host of culinary dishes. I am a small pumpkin ideal for Halloween carving but my flesh is rich orange and is very tasty and ideal for pumpkin pies. So you can eat the inside of me and then carve me into a scary lantern. 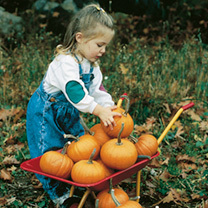 I will weigh about 2.5kg when grown and good for storing through winter.Ask An Adult for Help- Carve a scary face in the pumpkin and put outside your house on Halloween.FACT: Pumpkins are 90% water. 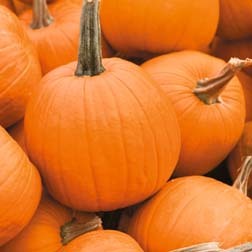 You will notice your pumpkin lantern starts to shrivel as it dries out. I’ve grown a huge pumpkin this year. OK it might not win prizes but it’s huge! It’s atlantic giant. 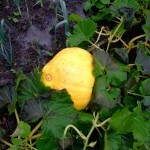 I didn’t stop it producing other pumpkins – have had one football size one off it too. Want to grow one yourself next year? Pumpkins are very versatile. 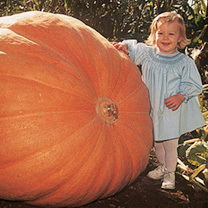 You can grow them for eating, Halloween carving, or to grow the largest pumpkin. 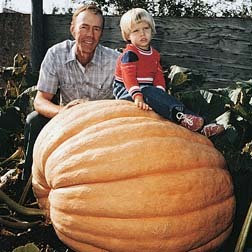 The largest pumpkin ever grown weighed 666kg (1469lb)!Sow my seeds: April-June. 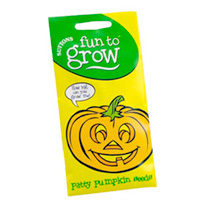 Sow your Patty Pumpkin seeds one each, on edge in 9cm (31/2) pots, 2.5cm (1) deep. Keep on a sunny windowsill to grow. Plant out when the risk of frost is past. You can also sow direct outside from May onwards. Sow in groups of 3 seeds 90cm (3′) apart. Thin to leave the strongest plant. 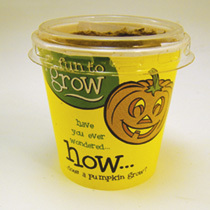 Care of your Patty Pumpkins: Your young pumpkin plants should appear in 5-8 days. As the plants grow, pinch out the tips of the main shoots when about 90cm (3′) long. 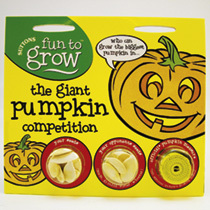 Yellow flowers will be produced followed by baby pumpkins. Remove any weeds and keep the plants well watered. Pick my pumpkins: Sept-October. You can harvest your pumpkins when they turn orange from mid September onwards. You can store them by harvesting before the first frost and storing in a cool room. Just right for Halloween!. Don’t walk on the ground when it’s this saturated. There’s very little you can do until it’s dried out. 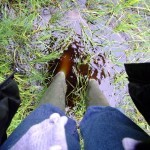 Walking on soggy soil will compact it and make it horrible to work with when it’s dried out. It’s times like this you’re greatful to have paths on your plot with bark on. The bark is a safe surface to walk on and you can collect veggies from the beds without walking on them. The current weather has been extraordinary. It’s finally stopped raining here but the allotments are going to be unworkable for a week or more – every plot is saturated! Raspberries can be quite invasive so you have to keep an eye on them. Planted at the edges of a lawn they’ll quickly find their way across but it’s easily controlled by mowing the shoots that come up. I adore raspberries. I love eating them fresh, love them on a flan with cream and enjoy making jam from them. I’ve also just turned 4lb of them into wine – it’s bubbling away at the moment and will take a few weeks before it’s ready for bottling! The wet weather means you have to pick your moments to go and pick them – the autumn fruiting ones in my front garden put on a real burst of fruit recently and it’s been great to get out and pick it. You can freeze the berries if you don’t want to eat them straight away. The traditional way to plant them is in rows supported by wires on posts. This allows you to keep them in check and enough room between rows to get between and pick all the fruit. In the height of the season you need to pick every day. You can plant them in a group in a patch of ground. They will be ok in a sheltered spot without support but will do better if they have some support in the open. Prune after fruiting down to the ground. Thin canes out every so often so that the ground doesn’t become oversaturated with them. Take the shoots that escape and pot on and pass them on to other gardeners. Grow Your Own Harvest Of RaspberriesGrows best in well drained soilPicture the enjoyment you will have picking your own home-grown raspberries, fresh from the garden. Raspberries require little maintenance and are easy to grow and keep. The abundance of red fruit produced can be eaten directly from the plant or if you wish, they can be frozen. These plants are great for cooking. Grow Your Own Harvest Of RaspberriesGrows best in well drained soilPicture the enjoyment you will have picking your own home-grown raspberries, fresh from the garden. Raspberries require little maintenance and are easy to grow and keep. The abundance of black fruit produced can be eaten directly from the plant or if you wish, they can be frozen. These plants are highly disease resistant. Grow Your Own Harvest Of RaspberriesGrows best in well drained soilPicture the enjoyment you will have picking your own home-grown raspberries, fresh from the garden. Raspberries require little maintenance and are easy to grow and keep. The abundance of yellow fruit produced can be eaten directly from the plant or if you wish, they can be frozen. These plants are highly disease resistant. Grow Your Own Harvest Of RaspberriesGrows best in well drained soilPicture the enjoyment you will have picking your own home-grown raspberries, fresh from the garden. Raspberries require little maintenance and are easy to grow and keep. The abundance of fruit produced can be eaten directly from the plant or if you wish, they can be frozen. These plants are highly disease resistant. The first ruffled pansy, and still the bestThese stunning ruffled pansies come in a range of pastel colours with dark centres, offer a long flowering period from Autumn through to Spring. 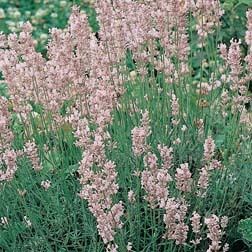 Classic hardy Autumn plantAn old classic, will bring vibrant pink shades to your garden throughout winter and spring. Very hardy, they have good resistance to most conditions. A beautiful miniature ruffled pansyWith smaller heads than the old favourite Pansy Can Can, this variety could add a new twist to your planting plans. 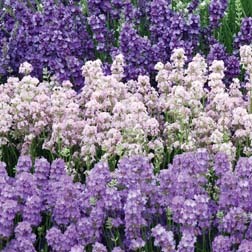 They have a range of lovely pastel colours and dark centres, and a long flowering period from Autumn through to Spring. Beautifully Bicoloured, Hardy Dwarf VarietyAntirrhinums, also known as Snapdragons, are a very popular Bedding Plant. Antirrhinum Rainbow is a dwarf variety that are tolerant of the frost and come in an attractive bicolour mixture. They will provide colour to your garden through out Autumn and again in the Spring. They have proven to be rather successful with cottage gardens. Perfect for late spring ordersA collection of double flowered Chrysanthemums, also known as Hardy Mums, that will flower well into the Autumn season (October). These varieties have been chosen for their hardiness and multi-flowering properties. As these are dispatched in June, they are ideal for gardeners who are ordering later in the spring season. A brilliant addition, perfect for complimenting PansiesThis variety of Bellis (Daisy) has large double blooms of red and pink shades. Providing an excellent complement to pansies, they will flower first in the Autumn and once more in the Spring. Imagine the delight of picking your own fruit, fresh from your tree on the patio! These Mini Trees are simple to grow, require little training or pruning and will produce an abundance of healthy delicious fruit fro ma single stem. You don’t need a huge garden to grow fruit. These trees will be happy on your patio! Home Grown Apples From These Trees Golden Delicious: One of the most popular varieties of apples. Produces a heavy crop of medium sized yellow fruit, with a sweet and tasty flavour. Gala: a crisp and tasty, medium sized dessert apple with a sweet flavour.Imagine the pleasure of harvesting and eating your own home-grown Figs, fresh from your garden. These two trees are so easy to grow and require very little maintenence. Each tree grows masses of apples. Varieties included in this pack are Golden Delicious and Gala. Home Grown Apples And Pears From These Trees Golden Delicious: One of the most popular varieties of apples. Produces a heavy crop of medium sized yellow fruit, with a sweet and tasty flavour.Conference: One of the most popular variety of pears, produces a long narrow fruit with a firm and tasty flesh. Most reliable variety for garden planting.Imagine the pleasure of harvesting and eating your own home-grown Figs, fresh from your garden. These Apple and Pear trees are so easy to grow and require very little maintenence. Each tree grows an abundance of fruit. Home Grown Cherries And Plums From These Trees Cherry Helena:Produces and abundance of sweet tasting cherries. Plum Black Amber: Dark and sweet tasting fruits.Imagine the pleasure of harvesting and eating your own home-grown Figs, fresh from your garden. These Cherry And Plum trees are so easy to grow and require very little maintenance. Each tree grows an abundance of tasty fruit. Home Grown Apples And Pears From These Trees Gala: a crisp and tasty, medium sized dessert apple with a sweet flavour.Doyenne du Comice: Produces a round fruit with soft, juicy flesh. Very sweet tasting, excellent dessert pear.Imagine the pleasure of harvesting and eating your own home-grown Figs, fresh from your garden. These Apple and Pear trees are so easy to grow and require very little maintenence. Each tree grows an abundance of juicy fruit.